If you're in the market and don't need the most cutting edge device, Amazon has a solid deal on the LG Optimus G for Sprint. The price for this handset has fallen to a single penny on a 2-year contract. This deal is open to all interested parties, whether it's for a new line of service or not. The Optimus G was previously only this cheap for new customers. 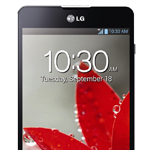 The LG Optimus G came out last fall, but it has since been overshadowed by the likes of the HTC One and Galaxy S4. But hey, there's still plenty to like in the Optimus G. The Snapdragon S4 Pro, 2GB of RAM, and LTE connectivity are still totally reasonable for a high-end smartphone. The same chassis was used to design the Nexus 4, after all. Sprint's version of the Optimus G also packs a 13MP camera. The software front isn't quite as rosy – the Optimus G is still running Android 4.1, and the feasibility of a 4.2 update is unclear. Head on over to Amazon if you're down. Sprint charges $100 for existing customers grab the Optimus G, so there are real savings to be had on Amazon.